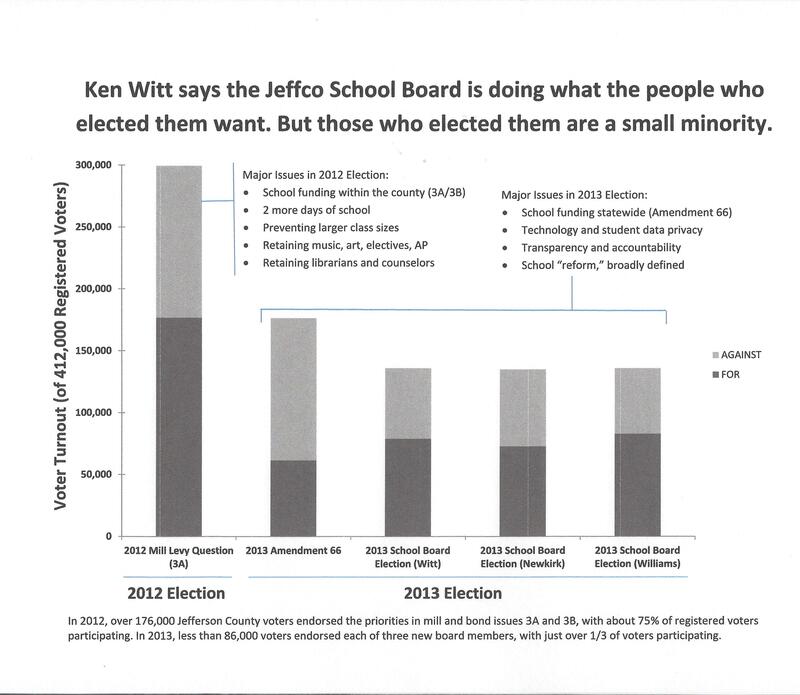 The major issues in the 2012 Election were funding for Jeffco Schools (3A3B), 2 added days of school, preventing larger class sizes, retaining music, art, electives, and AP classes, and retaining teacher librarians and counselors. Approximately 75% of registered voters participated. In the 2013 Election, the major issues were statewide school funding (Amendment 66), technology and student data privacy, transparency and accountability, and a broadly defined (sometimes undefined) School “Reform.” Only 1/3 of registered voters participated in this election. Our majority Board was elected by a small minority of registered voters. When any of our Board Members choose to say that they are doing what the voters want, that’s certainly up for intense debate. Every day we are contacted by someone who says they made a mistake. The best way to avoid mistakes is to become educated about the facts and participate. Join us by participating!